Cacciatore literally translates to “hunter” which puts it in the category of my favorite kinds of foods – hunter/gather slow foods. The true beauty of these kinds of foods is their delightful lack of pretension. In a modern context this means that you can forage in your own cabinets for the ingredients and as long as you’ve paid attention to their quality; you’re golden. For me, this means digging into the preserves I’ve saved up from last summer and scouring markets for wild mushrooms and having a great pasture raised chicken. The rest is the simplest of techniques, browning a simmering. Easy peasy. I’ve been serving this over a simple puree of cauliflower but it’s really easy and tasty to serve it over polenta or mashed potatoes. Heat olive oil over medium high heat. When oil is shimmery and near smoking, brown sides of chicken. (You’ll probably want to work in batches.) After chicken gets browned, transfer to a holding plate. (Don’t worry that the chicken isn’t cooked through.) If you don’t have enough fat left in the pan, (a light coating will do) add in some more oil, then add in onions, salt them and cover for a few minutes. When they’re starting to get translucent, add in mushrooms. When the mushrooms are tender and have significantly decreased in size, add in the rest of the ingredients including the chicken. Keep in mind that the ingredients are just a starting point. If you think more anything is needed, add it in. If you don’t have something, no worries. Reduce heat, partially cover and leave to simmer. It’s going to be awhile. I like to cook on low for an hour or two or until the chicken is falling off the bone. When it is done, I like to strip off the skin (feed it to my dog), then strip the meat from the bones (saving the bones for stock) and return the meat chunks back to the tomato mixture. While the cacciatore is cooking, break down the cauliflower head into flowerettes and steam until they’re easily punctured with a fork (about 15 mins.) Put them in a food processor, add in butter and process until smooth. 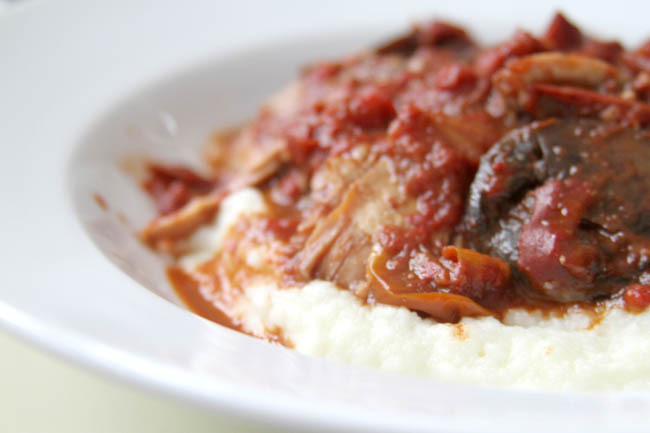 Serve cacciatore over the cauliflower puree and enjoy!